One of the most anticipated openings of 2018 in Jax was “The Profit” star Marcus Lemonis’ new MLG restaurant. Helmed locally by one of Jacksonville’s most beloved chefs, Roderick Smith, MLG is the 2nd location of what we assume will one day become a national restaurant group. As much as we loved Chef Roderick’s previous restaurants we were seriously excited to dive into the deliciousness at MLG. Despite the fast turnaround from the former Candy Apple Cafe, MLG has an entirely different feel than Candy Apple. Gone is the whimsy, the bright colors, the southern menu, the fun and funky cocktails. If that sounds like a drag, take heart. MLG brings a lot to the table. The space has been redone in cream and dark chocolate, with exposed bulb light fixtures. The setup, the tables, and chairs are still the exact same, the chair frames are just painted to convey the grown up feel of the new place. The Seminole Club building has over a century of history, and while MLG is new, it has an old world charm that fits the building without feeling old. We’ve been to MLG a couple times now, and in full disclosure we left the first time disappointed. That may have been in part due to unnecessarily high expectations. It may have been because we know Executive Chef Roderick Smith from previous restaurants and we came in already fans of his food, not fully embracing the fact that this restaurant is a second location for a Chicago-based restaurant. What I can tell you is that there is plenty to love on this menu, and also that it takes some time for any restaurant to find its footing. MLG threw an entire staff together and opened a restaurant in just over a month. That’s insane in the culinary world of construction delays, staff hirings, etc. 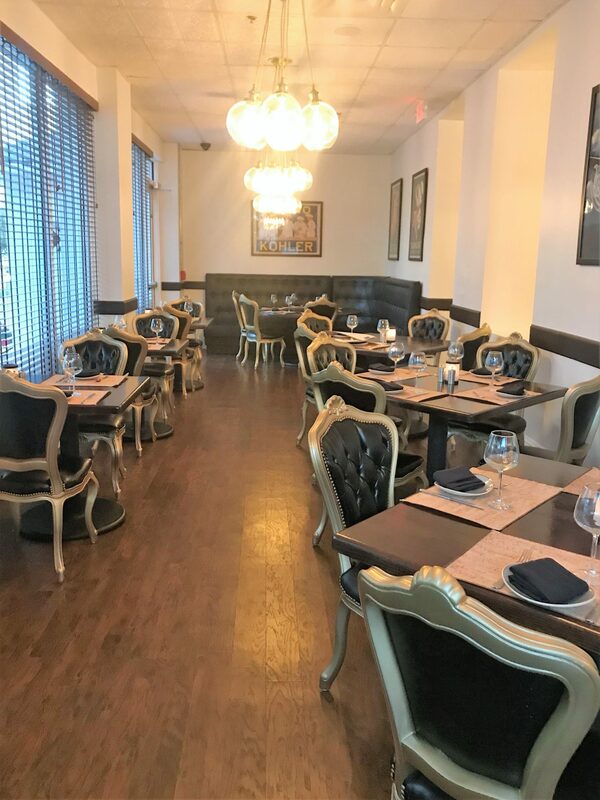 Our second visit to MLG a few weeks after they opened was much more in line with what a premium casual downtown restaurant might be. After we were seated and placed our order for appetizers out came a bowl of pork rinds and housemade chips. In a day and age where restaurants try to nickel and dime diners for bread and butter it’s nice to walk into a place that gives you something to munch on that’s fun and different with no strings attached. Thumbs up for starting things off on the right foot. The menu is deceptively large. It doesn’t feel cumbersome because it is one page front and back, but it is pretty all encompassing with nine different starters, soups, salads, burgers, sandwiches, seafood options, pasta, meat and poultry, and sides. 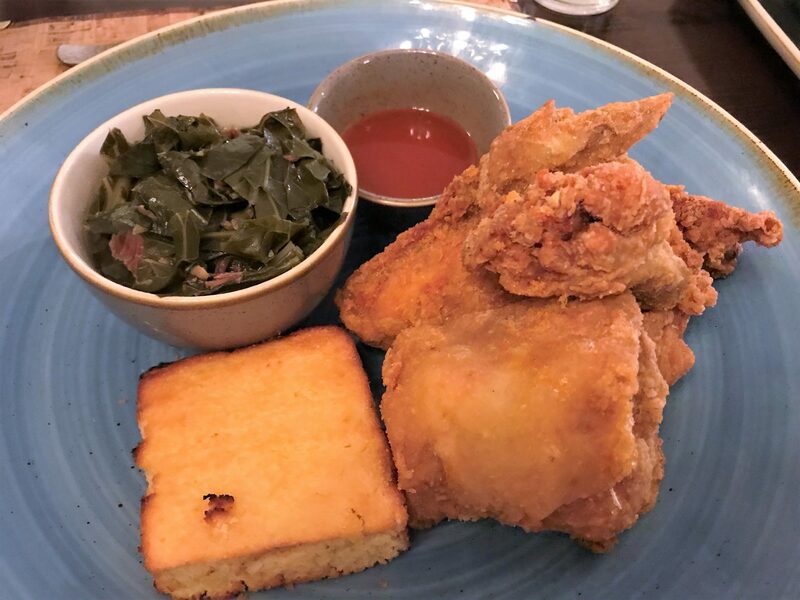 Stylistically it offers a handful of southern inspired options along with some more midwestern style choices and some older food trends. Realistically it is almost the same exact menu from the original MLG in the high end suburbs of Chicago. This is almost exactly the sort of menu my family from the midwest looks for. It’s hearty and has some sort of options everyone can feel comfortable with. For our appetizers we ordered The King’s French Onion Soup, the Crabby Patty, and the Wild Mushroom Flatbread. All three of these were visually appealing in the way they were plated. 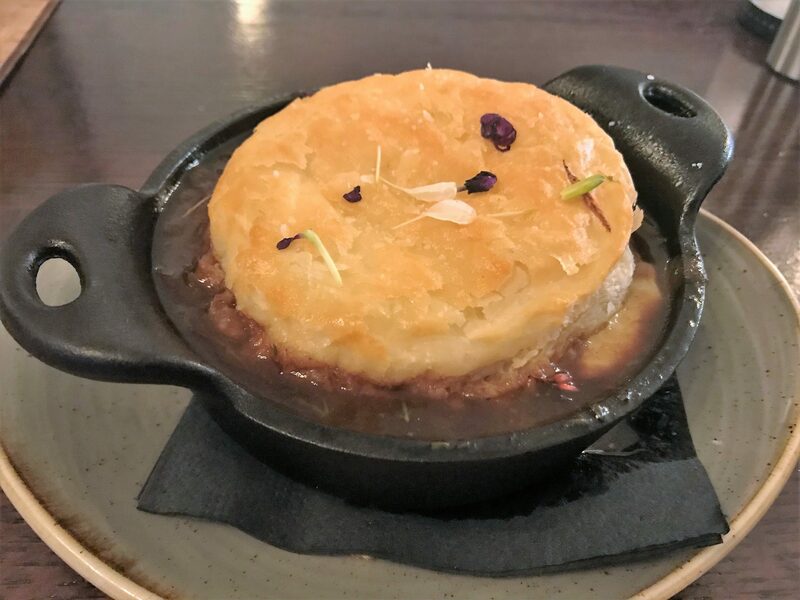 The french onion soup was topped with a circle of puff pastry that looked almost like a biscuit at first glance. Quite tantalizing. The puff pastry sat on some gooey, melty cheese, and the broth brimming with soft onions had a nice depth of flavor. This was enjoyable and I would order it again. The crab cake was the most expensive and least impressive of the appetizers we tried. It should be pricier, it’s crab. But at $17 for two crab cakes, the flavor didn’t placate the cost. There was nothing wrong with it, it just didn’t do anything for us. 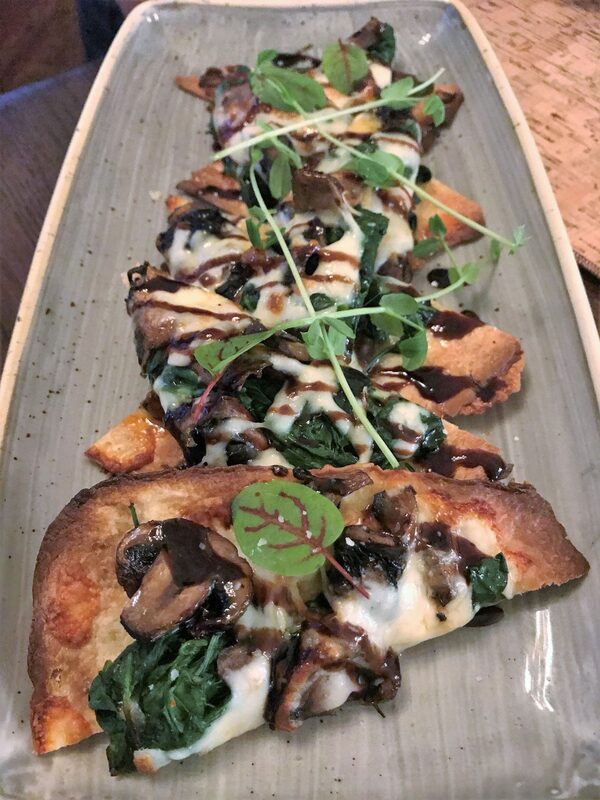 The mushroom flatbread was a nice, shareable appetizer. It was several triangles loosely overlapping each other on the dish, covered with sauteed spinach, fontina cheese, copious mushrooms, and finished with balsamic. There was some truffle oil in there, too. The truffle was nice and mild, not overpowering. This was a solid dish and good for sharing that absolutely anyone can enjoy. For entrees we tried the Southern Fried Chicken and Scallops+Shrimp Risotto. The fried chicken came with collard greens and cornbread, plus we got a side of mac n cheese and whipped potatoes because we like carbs. The fried chicken was good. The crisp skin melted in your mouth the same way the pork rinds did. The collards were understated, not too smoky or salty or spicy, though they did have some smoked meat lending some flavor. The cornbread that came with the fried chicken was incredible. The texture was on the softer side (don’t worry, it wasn’t soft enough to reach that cake consistency), and each piece is individually finished with a quick roast to caramelize the sugar on the edges, giving that crisp corner piece experience every time. It’s funny that such a small thing can have such a big impact, but it was one of the better pieces of cornbread I’ve ever had. Maybe the best? It had to be darn close. The mac n cheese was orecchiette pasta in a roux based cheese sauce. Orecchiette is small bowl or ear shaped pasta. The name actually comes from the Italian word for ear. Orecchiette is an elevated choice for mac n cheese, but I don’t think most diners will enjoy it as much as the more popular cavatappi, which hangs on to sauce and cheese better due to the grooves on the outside of each spiral tube. This is more personal preference and less a critique. I really hate to say it, but the cheese sauce was marginally gritty. It had good flavor, but the texture wasn’t ideal. It wasn’t enough to stop us from eating it, but it was a bit of a letdown. The mashed potatoes were of the lumpy variety I’m often served when I head back to see family in Minnesota. They’re not my style in that I prefer my mashed potatoes as smooth as possible but my mother would love them. We saved the best for almost last: the scallop and shrimp risotto was everyone’s favorite part of the meal. 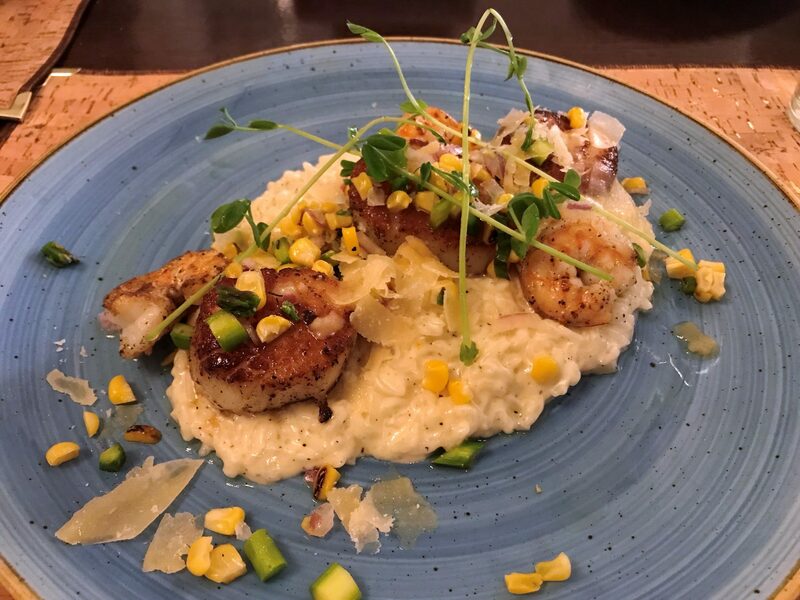 The sweet corn really set this dish off and made it a complete experience from a flavor and texture perspective, with the sweet and plump scallops, local shrimp, and the creamy delicious risotto. We ooohed and aaahed over every bite. I would go back to MLG just for the risotto. There’s no doubt this is some of the best risotto in town. The dessert menu at MLG features a few options from Marcus Lemonis’ other endeavors, including Key West Key Lime pie, which has been available at Sweet Pete’s since they opened in the Seminole building, and Farrell’s Famous Ice Cream Sundae, which we were told is simply a nod to Farrell’s, it does not contain Farrell’s ice cream. We chose the All-American Chocolate Chip Skillet and Jimmy’s Bread Pudding. The cookie skillet was of course hot with vanilla ice cream starting to melt presumably the moment it was scooped on top of the cookie. This was a yummy ending to a meal that I would not turn down. The bread pudding was better than anticipated. It wasn’t soggy or mushy like unworthy versions of bread pudding. The challah creation was fluffy and sweet, with crisp outside bits and house whipped cream, finished with Jack Daniels sweet caramel pecan sauce. Whew, that sauce! This is another that would be exceedingly difficult to turn down. It’s worth noting that we experienced excellent service on both of our trips to MLG. They have done a lot with the details that add character to a restaurant and make it memorable. The house chips and pork rinds that arrive to your table shortly after you are seated is one such decision. I haven’t stopped noting that more than half the restaurants I went to during the great recession took their bowl of mints away from the exit sometime between 2008-2009, and there are a number of restaurants that have actually placed a bread basket on their starters menu for $4-$5. The house chips and pork rinds feel especially generous in comparison. Another charming detail was how the check is presented. It’s placed in a book, not a standard black bill holder, but an actual book. It works because your cash or credit card can stick right in and won’t fall out, and it’s cute to see what book you get. MLG is a fully thought out restaurant concept; all these little decisions help convey the ethos of the place and give it authority. MLG has been killing it with their specials. There’s almost always an elegant and southern special to dive into. Plus they are now offering Sunday brunch, and a Friday night special of a free kids buffet if you make a reservation and purchase an adult entree. Don’t worry, it’s not overrun with kids. Overall we had a good meal at MLG. There were certain aspects that were excellent, namely the cornbread, risotto, and desserts. It’s not the super adventurous sort of menu we’d climb mountains for but it does fill a void in Jax. It’s a good option for downtown dining. Also, I always struggle with what local restaurant to enjoy a meal at when I’m dining with non-foodies. When I’m grabbing dinner with my mom or dad or other folks who feel like food with complex flavors are an assault to their taste buds MLG really is exactly the right fit. 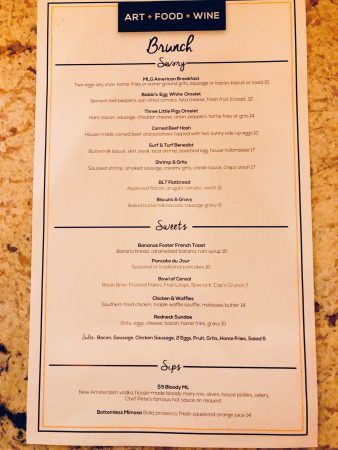 While I can dive into incredible risotto and the best cornbread this side of the Mason Dixon Line they can eat a straightforward pasta, a shrimp scampi or a well prepared steak at a good price. Next time I’m grabbing dinner with the folks you can bet MLG will be at the top of my list. MLG Jacksonville 400 N Hogan St Jacksonville, FL 32202 Note: From time to time we’re invited out to try a restaurant or to taste new menu items. This meal is usually comped, as this one was. We’re under no obligation to write a positive review or any review at all when we’re invited out to try a place. Every review you see on our site will be an honest review of the place whether or not the restaurant provided us with the meal at their cost. Tagged Alcohol Serving, Brunch, Casual, Date Night, Dinner, downtown, Family Friendly, fine dining, Full Bar, kid friendly, outdoor seating, southern. Bookmark the permalink.